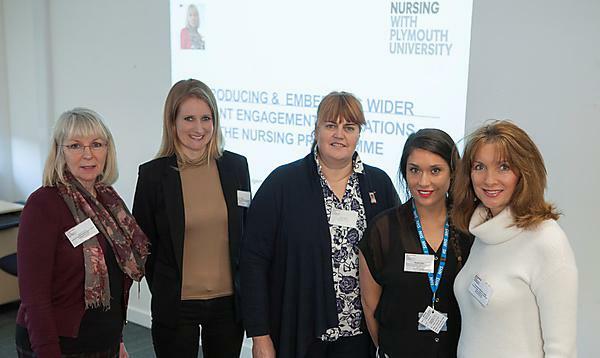 Plymouth University’s adult nursing students have been congratulated by Health Education England (HEE) for their pioneering methods of wider patient engagement. Ruth Auton, Senior Policy Nurse from HEE, visited the University earlier this month to learn more about initiatives including Patient Participation Groups (PPGs) – a national first that was set up in collaboration with Development Director at the Patients Association, Heather Eardley. She also heard about how nursing students are undertaking activities with patient representation organisations, using social media platforms and about the introduction of patient and carer feedback reports for student nurses during their clinical placements. Ms Auton has been working with a national team for Lord Willis’s independent Shape of Caring Review, ‘Raising the Bar’, published in March 2015, which aims to ensure that throughout their careers, nurses and care assistants receive consistent high-quality education and training that supports high-quality care over the next 15 years. She said she was putting together a picture of what ‘good’ looked like when it came to nursing education, and that Plymouth has embedded some great ideas. The wider patient engagement innovations work is led by Kim Young, Nurse Lecturer and Lead for Wider Patient Engagement in the School of Nursing and Midwifery, and she has introduced and developed the innovations into an education framework. Students have been taking lead roles with social media campaigns, raising awareness of vaccination programmes, finding solutions to working with ‘hard to reach’ groups and working with feedback platforms alongside the Patients’ Association and Patient Opinion to help gauge patient feedback and ensure best practice. A specialist tag on Twitter @PUNC14 (Plymouth University Nursing Cohort 2014) was also set up by Professor Ray Jones, also in the School of Nursing and Midwifery, to enable the students to exchange ideas of best practice and determine feedback from other online patient forums. Mrs Young said: “Obviously a nursing programme involves working with patients in clinical settings and placements, but at Plymouth University we want to work with patients in a wider sense by gauging their opinions, feedback and health choices in order to influence ideas of best practice going forward. “We are expecting new education standards for nurse education to be published by the Nursing and Midwifery Council (NMC) in 2017. Therefore any future programme re-approval will be developed to meet the requirements of the new standards. We anticipate that wider patient engagement philosophy will underpin these when published. In the meantime we have applied to the NMC for minor changes to the current curriculum to embed these examples into our current nursing programme”. The nursing recruitment day is a compulsory part of the admissions process for adult nursing. This guide will explain everything you need to know. As a vocational degree, the BSc adult nursing course here in Plymouth really prepares you for life as a qualified nurse. The support available from the University and nursing staff while out on practice is excellent.